The secret to rocking your meals and cocktails is just a mason jar away. A mason jar, fresh herbs, fruits or vegetables and a medium, like oil, spirits or water are all you need to create an infusion to pour over pizza, pasta, grilled meat or use in a homemade salad dressing. Or, to combine with other spirits for a cocktail. Prum and Williams also wrote “Shake: A New Perspective on Cocktails,” which showed readers how to craft cocktails at home. 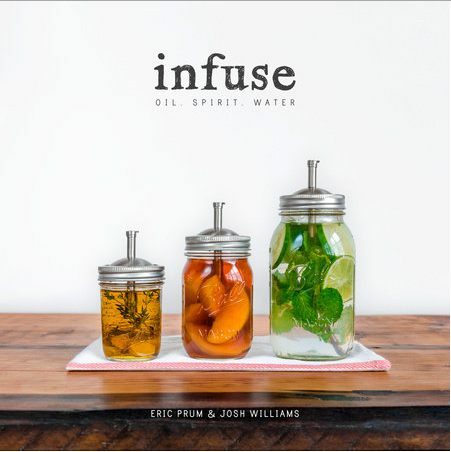 With “Infuse” the former college roommates explain tools, ratios and provide ideas for infusing fresh fruits, vegetables and spices in oil, spirits and water as well as recipes for using said infusions. What I liked about “Infuse” is its simplicity. 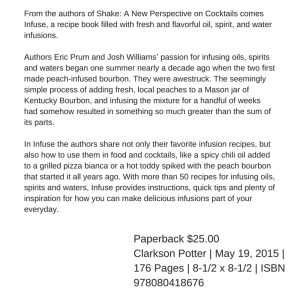 Prum and Williams explain concisely how to make your own infusions and what tools are needed. I’m most excited about trying “Overnight Limoncello.” Making limoncello has been on my list of recipes to try for a couple of years now. There’s a certain Italian food chain whose food is just okay but their frozen limoncello drinks are out of this world. But, the traditional method of making limoncello entails letting the vodka and lemons mingle for several weeks. That doesn’t work for my inner 21-year-old who likes Immediate Gratification. There is a recipe for Olio Santo, a spicy Calabrian chili oil that I want to try. Spicy chili oil can be drizzled over pizza or pasta. The book is laid out in four sections with The Basics first. You learn what tools you need for making your own infusions, most of which you probably already have. They include a muddler, vegetable peeler, strainer, peeler and cheesecloth. Basics also gives you the lowdown on what sizes of mason jar are best for which infusions. Think oil in an 8-oz, spirits in a 16-oz and water in a 32-oz or quart mason jar. 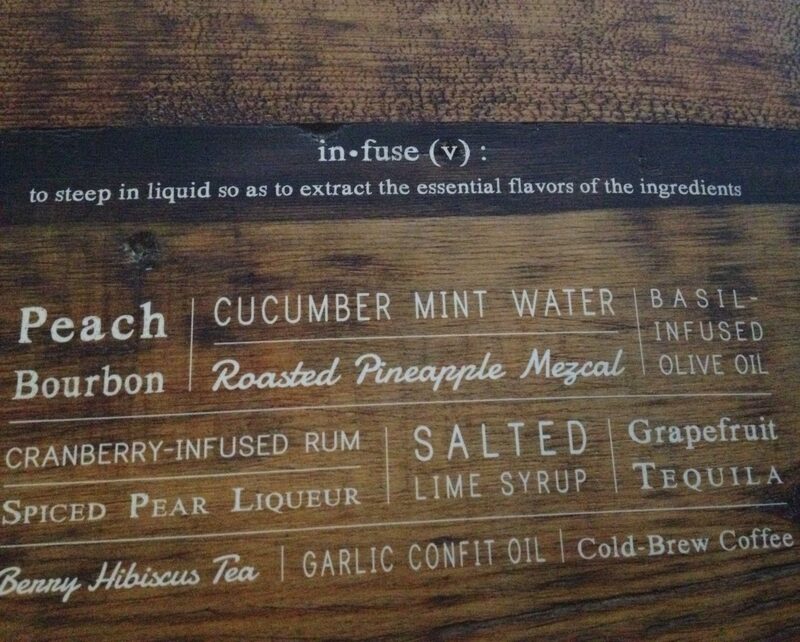 Infuse is further laid out with sections on oil, spirit and water with recipes interspersed. I’m so intrigued about exploring infusions I’m ready to give up my self-imposed ban on mason jars. That came about because I was going to shred my yoga mat if I saw another wannabe hippie or anatomically correct hipster sipping herbal tea with a metal straw in a mason jar. Just over it I tell you, but I will purchase a few jars in the spirit of creating infusions to amp up meal time and summer drinks. If you’ve wanted to add flavored oils to your pantry but your budget hasn’t allowed it, creating your own basil infused oil or rosemary mint oil to drizzle over bread or salad or grilled meats is much thriftier than buying them at a gourmet food shop. And, the oils will taste so much fresher. “Infuse” gives you recipes for all of those as well as sage oil. You can use the ratios in those recipes to create other flavors, depending on what vegetables and herbs you find at the farmer’s market or in your garden. With flavored oils at your fingertips you can transform even the most basic of grilled meats and vegetables with just one pour. “Infuse” has gorgeous photos so if you like visuals, this is the book for you. It isn’t clear from looking at the book jacket who shot the photos. I have just two criticisms. 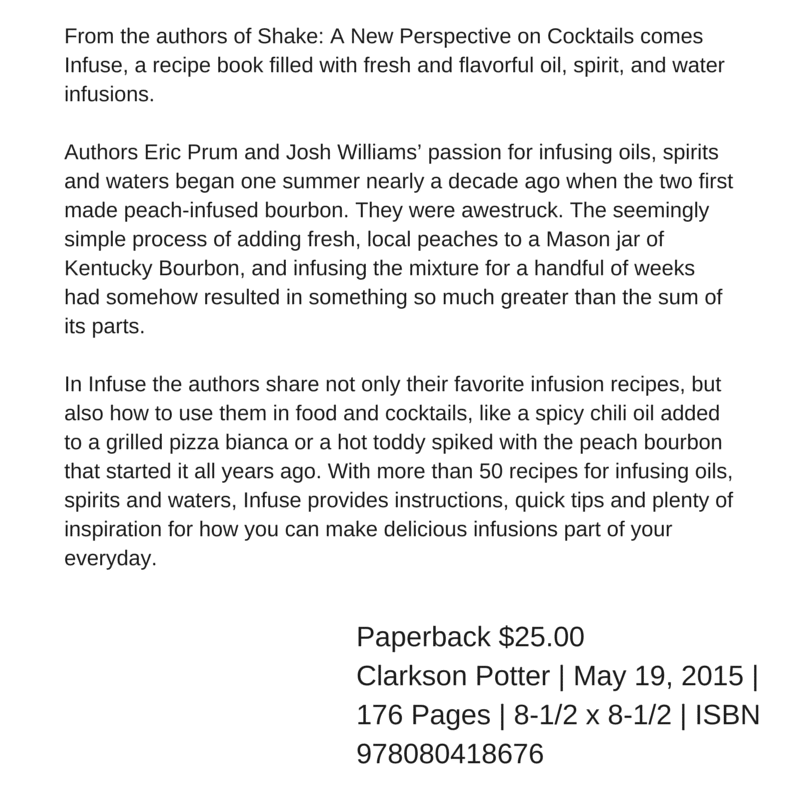 I would like the book to have included recipes or lists of suggested dishes for using the infusions. I was also a teensy bit disappointed in the pair’s recipe for “essential vinaigrette,” which seems like every other vinaigrette recipe I’ve ever seen. Tell me about your experience with infusions. Have you made any? What kinds? How did they turn out? How did you use them? Let me know if you can’t find the book at the library. Oh my goodness…tell you? Can I remember them all??? Of course there are teas of all imaginable kinds and flavors, herbal tinctures using vodka, infused fruit and herb waters galore, herbal vinegars – with more vinegars that I can remember – and oils…I don’t think I’ve ever had anything “fail”. And uses: just pure drinking pleasure, health considerations, meal enhancement. Sounds like a great read. I’ll check it out. Thanks for sharing. Mmm, infused herbal oils in skincare sounds intriguing. We have a couple of people in the area who market their own herbal skincare lines bu I don’t know if they’re using infused oils. I love any kind of citrus infusion – I do lime in carbonated water in the fridge and drink that instead of soda.